Pizza, gelato, pasta, vino and vespas. Ita��s not only a myth nor a known scene from Audrey Hepburna��s film in Rome; you can experience these (and much more!) everywhere and at any time of the year in Florence. But that is not the reason why I chose to do my Italian course in the Tuscan capital. In fact, I am a big fan of art a��and a bit of an artista��, hence I have always dreamt of going to Florence. 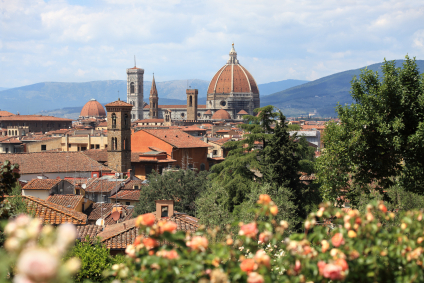 However, many other Italian cities were also very attractive to me, so why Florence? I only decided that I wanted to go to the Tuscan capital after one of my friends recommended it by saying the following words: a�?Especially you, who loves art, will love Florence. It is like living inside a fairy talea�?. And if you read this post you will understand why. Why did you decide to do an Italian coursea�� at the end of October? What a unconventional month to travel in, right? The shorter answer to this question is: fewer tourists a��and, of course, the reduced number of people in the class. It is much easier and more comfortable to travel around popular tourist cities after September since there are fewer crowds and shorter queues and you dona��t need to live in fear that everything may be sold out. With regards to the lessons, the chance of actively participating in a classroom with just 5 people is considerably higher and brings more benefits than attending a course with 15 students. Therefore, I went to Florence with the purpose of learning the basics of Italian. What I did not expect was to become so confident and fluent in the language. I knew, being bilingual in Spanish and Catalan that I had a headstart and a distinct advantage when learning Italian. Nevertheless, I never believed that I would be able to speak a new language after only having had a week of lessons. I didna��t realise how wrong I had been until I started the course. What did you do during your first week? After a short level test taken on the first day, I was placed with a group with students whose level was similar to mine. It was a small, cosy and friendly group. Considering that I am a very shy person when I first meet new people, I was not very keen on voicing any of my thoughts, but my teacher made everything easy for me and ensured that I was comfortable at all times. After the first hour, all my shyness and fears were left behind and I started my adventure in the beautiful world of the Italian language. Since the timetable for my lessons was from 9AM to 1PM, we had the opportunity to make the most of the day and visit the city in the afternoon, eat a panino infront of Santa Croce and calmly enjoy a cappuccino before visiting the duomo. From Palazzo Vecchio to Piazzale Michelangelo, I walked through and around the city in only one week after every lesson. How would you rate your learning experience during your course? 10 out of 10 and no less. Renata, my teacher, helped me at every moment from the very beginning. The content of the course was current and dynamic. She even made the more complicated and tedious points of grammar not only bearable, but enjoyable by preparing games and adding a competitive element. In addition, Renata doesna��t know how to speak English, so it was impossible for us to communicate with her unless we spoke in Italian. I understand that this can seem a bit scary but, when you consider that the reason you take an immersive course is, in fact, to be fully immersed in the culture and language of the country, it makes complete sense to only speak in the language you are learning. After making the same mistakes over and over and being corrected every time, I unconsciously learnt the right words and disregarded the wrong ones. Renata made us confident in being able to communicate in a foreign language, and this was one of the key points of the experience for me. The staff of the school, Centro Fiorenza, were thoughtful and attentive with us; they would ask me how I felt about the lessons every morning and they were always willing to help should any of us experience any trouble. They would organise different school trips every day; among them, a guided visit of the duomoa��s museum that also included the entrance to the cupola, the bell tower, the baptistery and the cript. The experience was fantastic; we learnt many interesting facts and saw wonderful works of art. The relationship with my classmates and the other students was so good that, when we finished the course, we exchanged our email addresses and social media profiles to keep in touch. I have even received a lovely email from the school to check on me. I stayed in a 2 bedroom shared student apartment. However, I was the only one who used the room (I guess it is because, again, October is not a very busy month). It was actually a very big house and the ground floor was entirely for me. There was a garden a��only accessible from my bedroom, a lovely and very traditional fully equipped Italian kitchen, a bathroom and a laundry room. My landlady, Piera, lived in the upper floor with her family and, even though I rarely saw her, she checked up on me frequently to see if I was comfortable or if I needed anything at all. Like every Italian I met, Piera was kind, caring and warm, and made my stay there amazing. So yes, I would 100% recommend it! 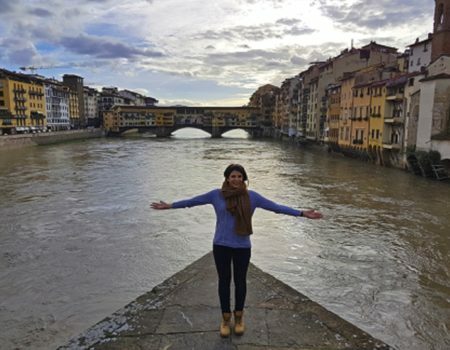 In Florence you can breathe art in every corner; there is beauty in every alley; the gastronomy is incomparable; the people there are warm, open and always ready to lend a hand; and I have been able to prove that, yes, ita��s true, visiting Florence is like living inside a fairy tale. 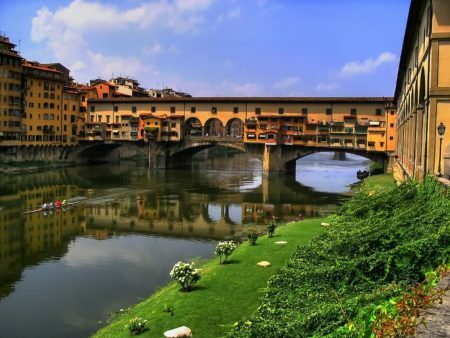 For more information on any of our courses in Florence from A?145 per week or for more information on any of our worldwide language holidays please call us on 01273 830 960 or email us. Our multilingual team will be happy to answer any questions you may have.